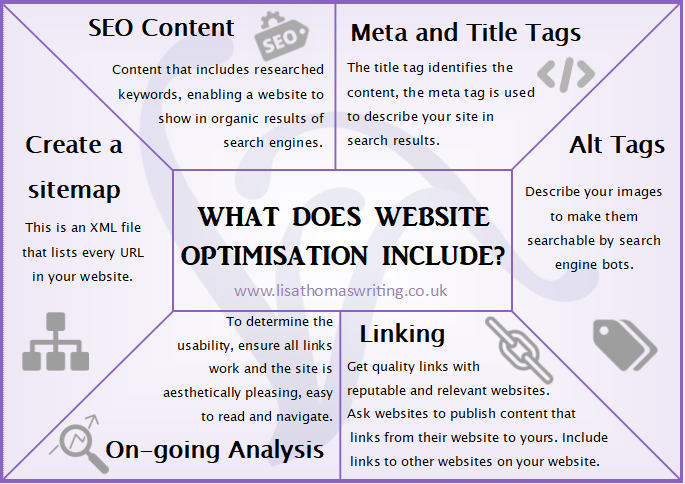 Home » Content Writing Blogs » What does website optimisation include? SEO content. Content that includes researched keywords, enabling a website to show in organic results of search engines. On-going analysis. To determine the usability, ensure all links work and the site is aesthetically pleasing, easy to read and navigate. Meta and title tags. The title tag identifies the content, the meta tag is used to describe your site in search results. Alt tags. Describe your images to make them searchable by search engine bots. Linking. Get quality links with reputable and relevant websites. Ask websites to publish content that links from their website to yours. Include links to other websites on your website. Creating a sitemap. This is an XML file that lists every URL in your website. Cover all these bases and you should see a noticeable difference in the performance of your website. To optimise a website you need to create high quality and unique content that includes relevant keywords. These keywords are phrases that you think an internet user might type into a search engine to find your website or business. Some keywords are more popular than others, which means there is more competition and you might find it more difficult to rank higher using them. You can improve a website by adding blogs and pages, but be sure that the content you use is unique to you. Read more about SEO content writing here. To get the most out of your website you need to regularly analyse it, make sure it works well, it looks good, it is easy to use and all the links work. First, determine what your goals for your website improvement are, this might be more traffic to your website, more people subscribing, more customers etc. Then compare how your website is performing now, in compared to how it used to, by using data from software such as Google analytics. Run a website audit to see weaknesses and where you can make improvements. Every time you create a new page or blog, you have the option to give it meta and title tags. Search engines use these to help with their analysis. The title tag tells search engines what the general content of the document is. While the meta tag is what describes your website in the search engine results. Without these search engines won’t be able to determine the relevance of your website. Just like your page or blog has tags to describe it, so should any images you use. By adding tags to the image, it becomes searchable by search engine robots, giving your website more relevance and quality. Linking is a website improvement you do not want to overlook. Linking involves creating unique, relevant and quality content that has a link to your website, then publishing this on other relevant and quality websites. In return, you will publish content on your website that links back to theirs. Doing this can improve a website through increasing referrals traffic, giving it a higher ranking in search engine results. Your sitemap shows search engines what content you have on your site, helping them to determine how relevant your website is. If you don’t have a sitemap, search engines are going to have a harder time establishing what content it includes. You can create your sitemap manually, or use a generator tool to do the work for you, then make it available to Google. Click here for more information from Google about creating a sitemap. To learn more about website optimisation, work your way through my website.